Rapid, robust and accurate determination of the size of large earthquakes is essential for tsunami warning and emergency response. At teleseismic distances, an earthquake hypocentre can be determined from the first seismic P waves within about 15 minutes after the event origin time (OT). However, current methods for determining accurately the size of major and great earthquakes, including the authoritative, Harvard Centroid-Moment Tensor (CMT) moment-magnitude, MwCMT, rely on long period S and surface wave recordings, typically not available until an hour or more after OT. Here we introduce a rapid and robust, energy-duration procedure, based on the Haskell, extended-source model, to obtain an earthquake moment and a moment magnitude, MED. Using seismograms at teleseismic distances (30˚-90˚), this procedure combines radiated seismic energy measures on the P to S interval of broadband signals and source duration measures on high-frequency, P-wave signals. 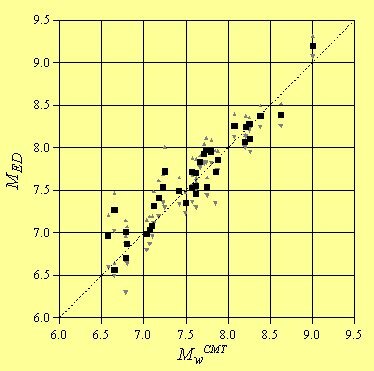 The MED energy-duration magnitude is scaled to correspond to MwCMT, and can be calculated within about 20 minutes or less after OT. The measured energy and duration values also provide the energy-to-moment ratio, Θ, used for identification of tsunami earthquakes. The MED magnitudes for a set of recent, large earthquakes match closely MwCMT, even for the largest, great earthquakes (see Figure below); these results imply that the MED measure is accurate and does not saturate. After the 26 December 2004, Sumatra-Andaman mega-thrust earthquake, magnitude estimates available within 1 hour of OT ranged from M = 8.0 to M = 8.5, the CMT magnitude, available about 3 hours after OT, was MwCMT = 9.0, and, several months after the event, Mw = 9.1-9.3 was obtained from analysis of the Earth’s normal modes. The energy-duration magnitude for this event is MED = 9.2, a measure that is potentially available within 20 minutes after OT. After the 17 July 2006, Java earthquake, the magnitude was evaluated at M = 7.2 at 17 minutes after OT, the CMT magnitude, available about 1 hour after OT, was MwCMT = 7.7; the energy-duration results for this event give MED = 7.8, with a very long source duration of about 160 sec, and a very low Θ value, indicating a possible tsunami earthquake. We show that the energy-duration methodology may be applicable at regional distances (GCD < ~30º). In addition, a test with near-field, strong-motion recordings for the 2004, Mw = 6.0 Parkfield, California earthquake suggests that it may be possible to extend the methodology to provide rapid information on event size at local distances, possibly at close to an early-warning time scale. Energy-duration magnitude MED from this study compared to CMT magnitude MwCMT. Lower and upper bounds on MED are indicated by grey triangles.